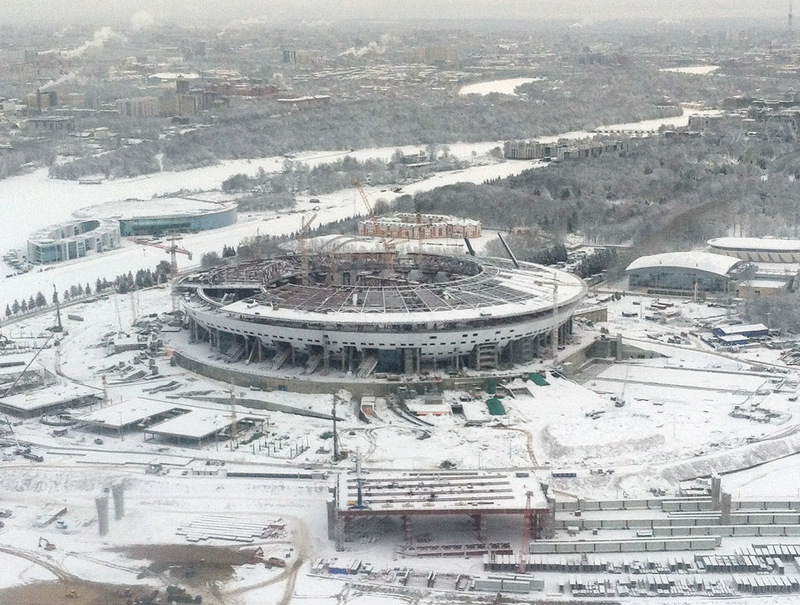 The new Zenit Arena was supposed to be open in 2009; instead construction on the stadium has now been going on for more than 7 years. The stadium is now scheduled to be finished in 2016, 7 years behind schedule and just in time for the FIFA Confederations Cup that traditionally takes place one year prior to the World Cup. The cost for this project has exploded. Initially the arena was supposed to cost €190 million, but instead it is now estimated to be over €1 billion. The German Magazine Kicker also reported on Thursday that 50 electrician working on the project have been unpaid and are now owned €210,000. The electricians have since filed for a lawsuit. The lawyer of the workers, Arkady Chaplygin, stated to Kicker on Thursday: “they were only paid for the first month of their work”. Unpaid salaries seem now in vogue in Russian football as national team coach Fabio Capello went unpaid for months. His salary was finally paid when oligarch (and Arsenal London shareholder) Alisher Usmanov loaned the outstanding $5.96 million to the Russian Football Union in order to pay the debt to Capello. It is, however, doubtful that the electricians of the Zenit-Arena will have their plight answered by one of Russia’s oligarchs. In both cases the delay in wages is one of the many problems that have arisen of Russia’s continued economic crisis and the free fall of the rouble over the last three months. Indeed there are indications that the Zenit-Arena could be further impacted with construction problems, as the rouble crisis has resulted in many migrant workers leaving Russia. Mikhail Demidenko, the head of the department of construction of Saint Petersburg, estimated that in January alone about 20% of migrant workers left the construction site of the stadium. With this in mind it remains doubtful whether or not the final bill will remain at the estimated €1 billion. Currently, England’s Wembley Stadium holds the dubious record as the most expensive sports arena in the world. Wembley cost £757 million, and much like Zenit’s new home, the construction of Wembley was hit by several delays that led to significant increases in costs. With many migrant workers leaving the city, the administration will be forced to replace these workers with locals who will likely demand higher wages. Indeed the case of the unpaid electrical workers highlights that increased labour costs have already begun to create financial problems for the stadium. With the fall of the rouble, Russia may continue to experience the end of relatively cheap labour, and in turn might be hit with a bill much higher than the estimated costs of $18 billion. The government has announced that it will try to limit the spending on the 2018 World, but keeping in mind the customarily high costs of infrastructure development in Russia, as evident by the extravagant costs of the 2014 Winter Olympics, and the end of cheap labour, the explosion of construction costs for the Zenit Arena could become a metaphor for the budget of the entire tournament.